When we visualise the golden era of music in Indian cinema we primarily think about the giant music directors like Shankar Jaikishan, Naushad, etc., or lyricists like Shakeel Badayani, Shailendra, Majrooh Sultanpuri or singers like Rafi, Lata who made major contribution to the music of that age. Among the legendary giants there were other composers who composed music for less number of films but created their identity and everlasting appeal even with the less number of compositions. Jaidev and Khayyam are two composers who received numerous awards for their classic performance and still remain few of the offbeat composers without whom the firmament of music would be colourless. Jaidev who came to Bombay initially from Ludhiyana to become an actor learnt music from K. Jaokar and Janardan Jaokar and Ustad Ali Akbar Khan and after ashort span of stay in his home town Ludhiyana, returned to Bombay with his immense command of folk and classical music. As he initially worked with Navketan Banner, he got a scope of working with SD Burman also. His debue with Chetan Anand’s film Joru Ka Bhai, 1955, gave him opportunity to compose independant music but he got recognition with the film Humdono in 1961. 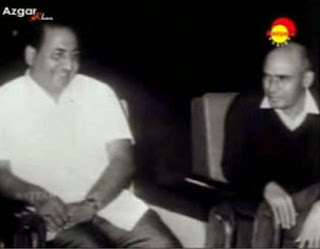 Humdono was also the starting point of Jaidev’s relationship with the man with the golden voice, Mohammad Rafi. The unique style of Jaidev included his tunes which appeared not to end with the antara or the sanchari and uniting them with the mukhra unlike other composers. Rafi’s voice had the effect of sedative which doctor’s prescribe for patients who cant sleep in the song “Abhi na jao chor kar, ki dil abhi bhara nahi” in Hum Dono. The way Rafi pronounced adhuri yaas, hardly any playback singer can think even today. The emotions of the character were kept intact and the musical value of the song was enhanced by Rafi in a tremendous way in Humdono. The ghazal in the film “kabhi khud pe kabhi halat pe rona aya” can be categorised as one of the ten best ghazals Rafi did sing in his life. At the same time the other song “main zindagi ka saath nibhata chala gaya” which showed the carefree attitude of Dev Anand, who got admitted in military in the film, had the effect of santoor and the prelude and interlude followed the main song of Rafi that music lovers even memorised them as a song itself. Lata Mangeshkar’s performance in the song “Allah tero naam” in raag gara was probably one of her best performances ever. Jaidev’s return path of the sanchari was again evident in the classical bhajan which is still sung sometimes as prayer song at other times in temples and places of worship. The other film he composed music for include Mujhe Jeene Do, 1963, where Lata’s song “Nadi nare na jao sham” became hit. As it was female oriented film with Wahida Rehman providing the lead performance there were hardly sequences for male songs. In the other film Kinare Kinare, in 1963, Jaidev asked Rafi to sing duet song with Usha Mangeshkar titled “maya anchal jale kaya ka abhiman”. His other notable songs for Rafi include “aaj ki raat hai bus jalwa dikhane ke liye” and “roop ki dhoop to dhalke rahegi” from the film Jiyo Aur Jeene Do, in 1969. Both were successful with Jaidev’s folk effect in the respective songs. In the 1970s, Jaidev shifted towards Ghazal singer Bhupinder Singh for most of his songs, with “Do Diwane Shahar Me” and “Ek Akela is shahar me” from the film Gharonda, 1977, directed by Gulzar with Amol Palekar in the lead role. Runa Laila’s song “tumke hona ho mukhko to itna yakeen hai” looked like it was never going to end with the brilliant lyrics of gulzar. The violin was played so brilliantly in the song “Ek akela is shahar me” depicting urbanised folk songs, that it identified the pathos of Jaidev who was a loner in life. The other successful film of Jaidev included Dooriyan, 1979, acted by Uttamkumar and Sharmila Tagore. There Bhupinder Sing’s song “Zindagi zindagi o mere ghar ana ana zindagi” and “zindagi me jab tumhare gham nahi the” showed Jaidev’s unconventional movement in the rise and fall of the antara and sanchari. Jaidev along with Madanmohan had composed music for Rishi Kapoor’s film Laila Majnu, 1977, where Rafi’s songs “barbad muhobbat ki dua saath liye ja”, “is reshmi pazeeb ki jhankar ke sadpe”, “likhkar tera naam zameen par” were superhits and marked Rafi’s tremendous combination with Rishi Kapoor. Jaidev received national award for the brilliant composition of music in the films Reshma Aur Shera, Gaman and Ankahi, most of which included Rajasthani folk music. Jaidev never got the recognition which he deserved. It is a pity that Jaidev got a scope of composing music for female oriented films where he made the best use of Lata Mangeshkar, because Rafi could have made enormous contribution to Jaidev’s remote style of music composition. Even then the combination of Rafi and Jaidev carry enormous musical value for music lovers across the country. Khayyam better known as Mohammad Zahur Khaiyyam is the other music composer, who had such an immortal appeal in his compositions, yet had not received the recognition he deserved. He was born in Jullundher, Punjab in 1927, and learnt music from Pandit Amarnath and Hunslal Bhagatram. Khayyam initially used Tala Mehmood in the song “Sham-e-gham ki kasam” in Dilip Kumar’s Footpath, 1954, where he made his debue and Mukesh in the songs “Woh subah kabhi to ayegi” and “phir na kije meri gustaq nigaho ka gila” in Raj kapoor’s Phir Subah Hogi, 1958. Although Rafi had one song “jo bor kare yar ko us yaar se touba” in Phir Subah Hogi, 1958 where it was a duet with Mukesh singing for Raj Kapoor and Rafi singing for Rehman. But Khayyam acknowledged the golden voice of Rafi in the film Shola Aur Shabnam, 1961, where most of the lyrics were written by Kaifi Azmi and Rafi’s songs “dhunti rehti yeh ankhe mujhme”, “jeet hi lenge bazzi hum tum”, “pehle to aankh milna”, “phool ko dhoonde pyaasa bhawra” had a soft, passionate flavour of the soil of mountains. The songs were picturised on Dharmender. In the film Shagun, 1964, the song “parbaton ke paron par sham ka basera hai” sung by Rafi carried the intoxicating appeal of Khayyam. The next film Mohabbat is ko kahte hai, 1965, picturised on Shashi Kapoor had a fantastic duet song of Rafi and Suman Kalyanpur titled “thehriye hosh me alun to chale jaiyega” which was a form of a poetry where each of the poets answered one another. In Akhri Khat, in 1966, Rafi’s song “aur thori der theher” had the same folk effect of Khayyam. Lata Mangeshkar was brilliant with her performance of “baharo mera jeevan bhi sawaaro” and “mere chanda mere nanhe” in the same film. In the 1970s, Khaiyyam composed music in lesser films but again came up with creative music and received the filmfare award for composing music for the film Kabhi Kabhi, 1975, where the title song written by Sahir Ludhianvi and sung by Mukesh and Lata were well acclaimed by music lovers of India. His composition in Umrao Jaan, 1981, brought him the second filmfare award and amazed the musical pandits with classical mujra, which became extinct from bollywood music at that time. His songs in the film Bazaar, 1982, picturised on Nasiruddin Shah, titled “karoge yaad to” had ghazal andaz and Bhupinder Singh was sublime with his performance. As Khayyam, like Jaidev, composed music in mostly offbeat films their presence was felt whenever the directors came up with thoughtful stories, powerful direction and rich lyrics. Although they have provided less number of songs for Rafi but the creations of the combination should be restored for the epic value of the folk and classical effects in the songs. Happy birthday to Moushumi Chatterjee. Happy birthday to Lara Dutta. Happy birthday to Arshad Warsi. Happy birthday to Ayesha Takia. Happy birthday to sensitive actor Aamir Khan. Happy birthday to Jaya Prada. Holi was played with grandieur in RK Studio.